Mathrani, S. (2014). Using enterprise systems to enhance organizational agility. Journal of Applied Computing and Information Technology, 18(1). In the corporate use of Information and Communication Technology (ICT), deployment of enterprise systems (ESs) technology in particular, has been the most vital development towards improving an organization's effectiveness. ESs make up the value chain of an enterprise allowing the organization to become significantly flexible and efficient. This paper investigates the use of ESs to increase agility within three New Zealand manufacturing organizations. Case findings reveal several aspects of ES utilization in agile manufacturing strategies such as concurrent engineering, value chain integration, and creation of virtual enterprise to proactively align work streams and increase responsiveness and flexibility. The paper discusses the importance of agile thinking in business and how an ES enables knowledge-based processes in critical functional areas to improve organizational agility. In the current era of economic globalization, organizations face severe challenges in regulating all facets of their business to achieve the required agility and effectiveness for competing in the dynamic marketplace. ICT representations serve an important part in the organizational value chain for supplying products and services to distributed markets. New technological innovations to support knowledge-based processes have come to the forefront. Concepts such as total quality management, six-sigma, concurrent engineering, strategic outsourcing, business process re-engineering, and flexible manufacturing are applied for increasing organizational effectiveness. Agile manufacturing is a key philosophy that cuts across these concepts for developing the ability of an organization to remain flexible and respond proactively to the constantly changing business environment. This manufacturing strategy creates an operational environment by integrating human skill sets with the ICT infrastructure to transform businesses into highly knowledge-intensive and action-oriented companies (Sherehiy, Karwowski, & Layer, 2007). Therefore, deployment of agile manufacturing concepts is an emerging trend to improve overall organizational competitiveness in turbulent global markets. It links the market turbulence to the application of agile philosophy to "competitiveness of the firms developing this new production model" (Bustelo, Avella, & Fernandez, 2007, p. 1308). In use of ICT in industry, implementation of enterprise systems (ESs) technology has been the most critical development towards improving an organization's effectiveness (Davenport, 1998; M. Zhang & Zhang, 2009). ESs link different functions that make up the value chain of the enterprise allowing a company to become significantly flexible and efficient (Chen, Law, & Yang, 2009). Firms such as SAP and Oracle offer these off-the-shelf software solutions, which integrate information flows from different functional modules such as planning, procurement, production, warehousing, and logistics through a common data repository to provide a shared view of best-in-class business processes. This paper investigates the use of ESs to achieve improved agility within New Zealand (NZ) manufacturing organizations. Case studies are conducted in three manufacturing firms to evaluate effectiveness of ESs in transforming corporate data into knowledge for decision making and results. We discuss how knowledge-based processes are applied in critical functional areas to increase manufacturing strengths that lead to organizational agility. The issues of ESs effectiveness are assessed in the post-implementation phase to examine the business practices that are complemented with knowledge processes to be agile. Thus, the paper explains the importance of agile thinking in business, the various ES tools and techniques used in manufacturing operations, and discusses how organizations rely on these systems to enhance agility. This section has introduced the intent of this paper. The next section explains the theoretical context with reviews of related literature. An analysis of how the ES data transformation framework fits in the agile manufacturing structure is explained in the third section, which provides the methodological guide for this study. The fourth section outlines the research methodology with an overview of the stages in the conduct of the study. The fifth to seventh sections discuss findings from the three NZ firms to explain how ESs are aligned for agility. The concluding section summarizes the results. Product life cycles are shortening making slow-moving and lengthy logistics unsustainable. Organizations are forced to re-look into the management of their supply chains to make them more responsive and flexible. Agility, therefore, is the key for survival in changing conditions (Christopher, 2000 ; Lei, Lian, & Xiao, 2011). Agile supply is concerned with developing capabilities proactively to position a supply chain to benefit from marketplaces in which product life cycles are shrinking, product variety is increasing, and the ability to forecast demand is reducing (Hasan, Sarkis, & Shankar, 2012). Thinking agile provides additional operational ammunition to craft a winning strategy by embracing change and making dramatic performance enhancements in an increasingly competitive market. Some of the key characteristics of an agile company include exploitation of ICT to the fullest, leveraging of all its capabilities, and working through entrepreneurial and empowered teams (Choudri, 2002). ICT-based infrastructures encompass inter- and intra-organizational value chains to "become a common building block of next generation agile manufacturing systems" (Gunasekaran & Yusuf, 2002, p. 1364). 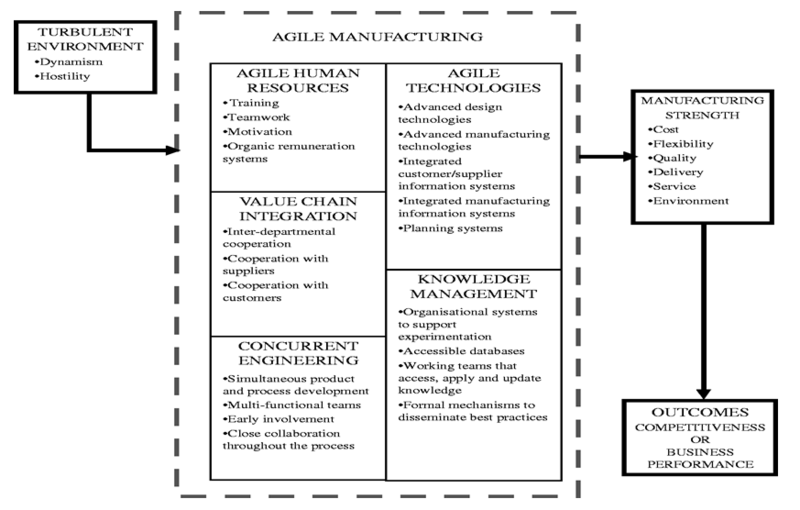 An agile manufacturing production model conceptualized by Bustelo, Avella, and Fernandez (2007) is shown in Figure 1. The model integrates technology, people, and knowledge assets to create an information and communication infrastructure for organizations to respond effectively in a coordinated way to business turbulence. The agile manufacturing framework classifies five building blocks comprising human resources, value chain integration, concurrent engineering, technologies, and knowledge management that enhance organizational capabilities. These building blocks assist in developing overall manufacturing strengths by reducing costs and increasing flexibility, quality, delivery, service, and environmental benefits that lead to improved business performance in expanding global markets (Bustelo et al., 2007). Strategies are deployed through tools such as ESs, to automate information flows and reuse system resources ensuring agility across all of the building blocks in distributed manufacturing processes, enhancing organizational capabilities and competencies. ESs address the manufacturing requirements through seamless integration of the entire value chain. These systems permit organizations to adapt their business processes to the changing needs of the "current business environment", thus improving efficiency and effectiveness (Goodhue, Chen, Boudreau, Davis, & Cochran, 2009). With technology advances, ES applications have become Internet-enabled and more collaborative. Modules such as customer relationship management (CRM), supply chain management (SCM), and business intelligence (BI) have been included to achieve the collaborative responsiveness and information intelligence needs of organizations (Subramoniam, Tounsi, Ghani, & Krishnakutty, 2009). As distributed teams interact and align activities in various development and manufacturing stages across enterprise limits, collaborative software tools play an important part in translating business objectives into tangible outcomes. Further, within the specified schedule and budget constraints, ESs necessitate alignment of different work streams across distributed teams and third party logistics firms with real time information and data sharing (Banker, Bardhan, & Asdemir, 2006; Ragowsky & Gefen, 2008). Managers receive accurate real-time information reflecting their existing business status as well as connecting and managing information flows across multifaceted organizational structures (Davenport, Harris, & Cantrell, 2002). Organizational knowledge is a physical asset or a commodity, which is exploited for maximizing return-on-investment. It involves interplay between past experiences and their subsequent applications to create new knowledge through the development of an overall organizational resource in which both technology and humans play an important role (Baskerville & Dulipovici, 2006). The knowledge assets form the inputs, outputs, and the moderator to the knowledge creation process, as these assets are organized, shared, and made available to numerous groups in the organization through effective use of ICT (Choo, 2006). Knowledge management (KM) is the organizational capability to collect, store, and access the work related knowledge of best practices and decision making from managers and workforce for both group and individual behaviors (Bergeron, 2003). It assists in saving on duplicating effort, encourages knowledge distribution and creates a collaborative work environment, thus reducing time and cost spent (Berkman, 2005). Technological tools help to process underlying information from different analytical viewpoints objectively incorporated by codifying experiences and contexts into business rules. This enables organizational learning as "best practices" (Keyes, 2006, p. 23), and supports use of information for decision making. Leveraging ICT tools such as ESs underpin such knowledge requirements when these systems are aligned with agile philosophies to improve responsiveness and flexibility. For example, in planning production order release times under varying conditions, the proper management of schedules allows production orders to flow smoothly through the manufacturing system for timely delivery. The system optimizes lead times and increases responsiveness to market changes, and thus enhances organizational agility. Further, to utilize information from ESs, BI tools are deployed to assist in extracting relevant data for analytical decision making. BI supports extraction, evaluation, and reporting of organizational data in the different operational activities throughout the value chain (Nicolaou, 2004). Therefore, BI systems are sometimes referred to as "data-driven DSS" (Power, 2007). BI tools assist in the use of contextual data for analyses to establish action-based business decisions. With simplified procedures to access accurate real-time data, improvement trends are indicated in strategic planning and execution such as reduction in operating costs and better collaboration across business units (Maditinos, Chatzoudes, & Tsairidis, 2012). BI tools empower organizations to establish knowledgeable decisions quickly enhancing speed and agility in operations. The study evaluates the influence of ESs in achieving manufacturing strengths that lead towards an agile strategy using case research design. In this study, quality is established using construct validity that addresses development of operational measures of the study's phenomena. The validity of case research is established through a priori specification of constructs based on Bustelo et al. 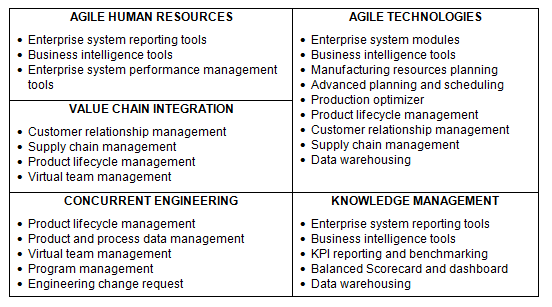 's (2007) model, comprising agile human resources, agile technologies, value chain integration, concurrent engineering, and knowledge management as building blocks for the agility phenomena. The analysis includes outcomes leading to manufacturing strengths in cost, flexibility, quality, delivery, and service. This study adopts "methodological pluralism" combining a focus to achieve qualitative distinctiveness of each case with utilization of theoretical proposition, incorporating both positivist and interpretive approaches to better achieve the research outcomes. Therefore, in this study a postpositivist focus captures contextual evidence from a real world phenomena with respect to theoretical propositions (Denzin & Lincoln, 2003). The epistemology underlying this research utilizes postpositivism for reliable and objective findings. The ontology assumes that the phenomena under study are singular, objective, and independent from researcher. The three case studies of ES implementation were selected on the basis that the cases should have implemented ESs for at least three years and so are in the mature phase of realizing benefits. Twenty-three semi-structured interviews between 1-3 hours each were carried out with senior management teams (e.g., manufacturing director, general manager, operations and supply chain (O&SC) manager, purchasing manager, IT manager, finance controller, quality manager, senior purchasing officer, and production engineer). In the interview, questions were asked to extract information such as how use of an ES and its information can enhance organizational agility in supply chain operations. The empirical findings are reported in the next section. This section presents results of the interviews at the three high-tech electronics manufacturing organizations namely Aevon, Bevon, and Cevon (pseudonyms) to examine the impact of ESs in implementing agile strategies and enhancing manufacturing strengths for agility outcomes related to costs, flexibility, quality, delivery, and service. The profiles of the three organizations are presented in Table 1. The use of ESs and its data to realize beneficial outcomes and organizational agility are elaborated for the three cases. Interview extracts have been used to empirically ground results with case study data. Findings have revealed that SyteLine 7 (SL7) helps in several functional aspects of supply chain operations. In new product development, it provides information on how the cost of the new product is coming through. The bills-of-material (BOM) is configured in SL7 that informs on the BOM cost break-down, costs spent on tool development, and onetime non-recurring engineering charges such as cost of arranging set up for the production of the printed circuit board design. It also provides product data (components and assemblies) and process data (machine tools and equipment) support, which enables cross-functional teams to concurrently develop products and processes with ease. The R&D manager noted, "It would be quite a task to design new products without support from SyteLine. The project teams would struggle to find relevant information." Furthermore, SL7 provides Aevon the facility to maintain history of engineering change requests (ECRs), with information such as when and why an ECR was raised, when it was implemented, and who was the approver to maintain full traceability for the change. The operations and supply chain (O&SC) manager explained the execution of the order intake process in SyteLine through the remote access using Aevon's Web portal. The regional sales persons directly create and enter the order data themselves. "They can find out, for example, how much inventory of parts is available, their costs, make commercial decisions and commit deliveries to customers without having to wait for this information to come from the Auckland operations team." The regional time differences do not disrupt the transactions due to the Auckland office closing in the evenings. This has improved customer responsiveness and relationships with better information visibility. The O&SC manager clarified that the organization is now e-commerce enabled. A utility is created by which orders coming through the portal are automatically transferred as jobs into SL7. The automated creation of jobs eliminates possibility of human errors. "This also eliminates issues such as faxed orders missing or fax machine under breakdown. This has improved our business process and efficiencies with faster and more accurate transactions". The company has developed a sales and operations planning (S&OP) process in which orders and forecasts are updated through regular communication within regions. The planners in the Auckland factory review demand with the regions on a regular basis using a six-month horizon. With these processes, Aevon has been able to successfully supply stock to regions and fulfill customer demand while continually monitoring and minimizing inventories. The manufacturing process is driven by the released jobs due dates and the production schedules assigned by the advanced planning and scheduling (APS) system in SL7. The production engineer explained "automated production schedules are created for all released jobs, optimizing the capacities and resources in the factory. This helps us to prioritize production based on customer due dates and the material available. The use of APS has helped in achieving production targets due to greater visibility and instant alerts for exceptions raised". The integration of quality/sampling plans with purchase orders and schedules to suppliers, including inwards goods receipts and receipt inspection, has improved the quality of material receipts and reduced quality issues with suppliers. Aevon has achieved better control on third party subcontracting with increased visibility of information. "The subcontractor gets automated delivery instructions based on the number of days' supply configured in the system. We have the record and visibility on the various materials sent and available at our subcontractors end". Aevon has set up multi-level bills-of-material in SL7, which provide all the item-level details of a product in the exploded BOM view. "When customer orders for finished products are put in, depending upon the BOM configuration, the manufacturing and purchasing actions are driven through the MRP [materials requirements planning] order action report. The operations team executes the MRP generated plans and reviews on a weekly basis. This has reduced out-of-inventory events that happened frequently earlier and affected the production lines. The supply flexibility has also improved, reducing the overall costs." For achieving the company's strategic objectives, SL7 data are interpreted and analyzed in the various operational areas to support decision making using the standard reporting templates in the system. The O&SC manager suggested some additional methods and future plans of using ES information for decision making. "We want to create dashboards and monitor for the key financial and operational areas once our business intelligence module is operative". At this time, Aevon's focus is to set up BI for sales reporting and, later, to have such information available for other areas. Aevon is planning to start using a balanced scorecard, but it will not be a part of SL7 which, according to the respondent is an "unfortunate thing". However, the O&SC manager reiterated that the process has been initiated. "Aevon is planning to commence setting up KPIs [key performance indicators] for some of the functional areas. The idea has been transferred across by the executive team to the functional lines and they would be setting up KPIs for their approved goals soon. Once these are set, the executive team would begin monitoring and controlling using the scorecard and SyteLine information." Since the implementation of SAP, the product development time is slashed through the use of built-in multi-user project management and workflow features with projection of delays or hold-ups in project plans. According to the IT manager, "SAP tracks projects and development costs on a real-time basis including an update by product, after an engineering change". Such changes to the processes has smoothened the product development process at Bevon expediting new innovations and utilizing the advantage of technological advances. Additionally, the planning function has become more streamlined with better visibility into the past, present, and future forecasted demand from customers. Powered with this information Bevon plans materials, production capacities, and shop-floor manpower through SAP to meet the demand. "SAP runs the MRP process each night reviewing the latest product demand, stock on-hand and in the pipe, availability of production capacities and resources, providing an optimum plan for manufacturing. Based on this information the buyers release purchase orders to the vendors wherever required." According to the respondent, there are features in SAP for simulating constraint-based production planning scenarios which are essentially useful for finalizing the monthly production plan and gearing up to achieve it. The system also has features for analyzing market trends that helps the salespersons decide on future sales strategies. The operations manager noted, "By utilizing the critical data as well as the tools to analyze and interpret information, has led to more accurate delivery commitments to customers." The most effective change in the manufacturing environment for Bevon is the improved agility to respond to any demand changes in the dynamic marketplace. Despite Bevon's close monitoring with customers through regular reviews and demand planning, frequent changes to the demand pattern occur that are unforeseen based on the market variations. "In the event of a sudden increase or decrease in demand or revision in product shipment dates from customers it is expected that we should be able to respond to such changes positively and effectively. SAP has provided us the flexibility to handle such changes. The system responds with exception messages and reports on the actions that are required to be taken to meet the revised plan. It highlights areas for purchase order adjustments or changes to the manufacturing plans and schedules to the factory." In the second phase of implementation at Bevon, a "production optimizer" module has been added as a bolt-on to the SAP system for constraints-based dynamic machine loading. "This module is especially useful for scheduling and loading SMT [surface-mount technology] machines for manufacturing PCBs [printed circuit boards], improving utilization, productivity, and execution of plan in the factory." With the implementation of SAP, best business practices related to inwards goods and warehousing processes have been introduced in Bevon. These processes have enabled swift and accurate receipt of materials, efficient storage in the warehouse including first-in first-out process for shelf-life items, just-in-time (JIT) parts supply to the factory for processing, and on-time dispatch of the finished goods to customers. The SAP system has built-in checks to avoid any data entry errors, triggering rule-based alerts such as transactions leading to a negative stock, and creating transactional records that could easily track stock movements for traceability. Bevon staff can now track inventory within the various company stock locations such as inwards goods, distribution warehouses, and production shops through the SAP system. The raw material inventory is tracked by lot numbers and finished goods by serial numbers. After the goods are dispatched to the customer, the in-transit movement of the finished goods is tracked by serial numbers until the goods reach the final destination. "With such controls in place, the accuracy of stock and visibility to all stakeholders has improved dramatically. In case of any shipment errors or product quality issues, the transactions are traced back to explore and resolve discrepancies and identify the production job the lot relates to. Built-in performance management tools are available in the SAP system for in-depth, enterprise-wide performance management. Specified information requirements are easily and quickly achieved through the drill down facility, without programming every time. This helps Bevon take timely actions supported by critical business decisions, backed up with high-quality and well-analyzed ES data. The operations manager stated, "Today there is a growing requirement for more business monitoring which creates more data which in turn presents the opportunity for greater knowledge. We use the standard SAP business analytics and reporting tools to create the KPI and benchmarking reports for our operational functions on a monthly basis. The data are collected, manipulated, and the business performance report is put together each month for review of the executive management team. The business KPIs are also monitored through trend analysis using graphical representations. These reports get passed off from the middle management to the top and supports organizational decision making". Cevon has implemented a Web-based product lifecycle management (PLM) system as an add-on to SL7 to manage their product development in a globally distributed environment. The company has two development centers, one in NZ and another in the US. Also, to meet their growth requirements, Cevon has outsourced manufacture of some products to Indonesia. The reason for selecting their Indonesian partner was because the company had manufacturing capability and was in the business of supplying similar products already. Although the Indonesian company was their competitor in business, Cevon thought the company would be a competent partner to supply quality products quickly. Cevon has geared itself through the use of their PLM system to manage development of new products in its globally distributed environment. Product development teams from the US, Indonesia, and NZ now interact transparently with each other regardless of geographical boundaries. The PLM system provides three key functionalities, which are controlled centrally namely, the engineering, program, and team management functions. The engineering functionality allows users to work with part information, drawings and specifications, facilitating concurrent engineering and strategic sourcing. The program functionality helps in complex project management across company's distributed development centers, suppliers, customers, and business partners for new product introduction. Finally, the team management functionality offers a central virtual workspace for cross-functional and intra-enterprise teams of customers, suppliers, partners and employees to collaborate globally. The respondent noted, "The product development time has drastically reduced since the use of PLM in conjunction with SL7. It has improved collaboration with external partners and made a major impact on the new product development process". Cevon has added another bolt-on service module called FS-Plus. This module supports regular service functions such as field servicing, where engineers go out to service or repair products that have failed at customer's site. This module also helps when faulty products are returned for repairs and the ownership of those products still remains with the customer. "In this system a record of the kind of repairs being performed is maintained that helps to find the root cause of problems and evaluate the type of faults that are causing failures to products and its related costs. This information, when fed back to the design engineers, helps them assess the issues and review how they can improve the design to try and eliminate warranty returns and its associated costs." The O&SC manager explained their revised S&OP process. "SL7 helps planners to generate a six monthly forward order rolling plan by region using BI and review with the regions on an ongoing basis. With the new process, changes to the demand become timely evident. SL7 responds instantly adjusting the procurement and manufacturing plans." Further, the recent addition of APS (advanced planning and scheduling) functionality has made a major change in achieving accuracy in Cevon's forecasting process. In the revised process, based on the demand quantity, an ATP (available-to-promise) is requested from the system. This is done while entering a customer order or a forecast with the customer's requested delivery date. As explained by the O&SC manager, an ATP executes a planning run for that specific order line and informs acceptance of the requested date or provides an alternate date with a report on the delay. The planners can drill down to review the bottlenecks, and understand the reasons for the delay such as either component receipt dates are causing the problem or the availability of capacities or resources. This information is used to communicate with purchasing and manufacturing to review possibilities for meeting customer demand. "With APS, we can respond proactively to demand changes. It helps in not letting us lose any new business opportunity that comes our way. Provides ability to match demand with supply, and deliver to customer expectations." A bolt-on BI application called Cognos Impromptu has been implemented at Cevon to SL7. The IT manager opined that the BI tool helps in creating ad-hoc reports based on challenges faced by users at any time. The BI tool insulates the user from the database complexities, allowing the user to focus on data analysis that drives the business. Through the SQL-based query engine of the BI module, several ad-hoc queries can be executed and the output seen through user customized reports. The reports could also be transferred into Excel for further manipulation. "So, users have the ability to extract and create information themselves for their decision making." For tracking progress of business goals, digital dashboard and balanced scorecard performance management systems are used alongside the BI module. The scorecard provides the metrics directed towards achieving the company's objectives through regular reviews. The executive management gets a snapshot of performance indicators through digital dashboards to assess the performance of key measurable such as monitoring revenue forecast. Additionally, Cevon has also implemented a SyteLine data warehouse (DW), wherein specific data related to customer orders, inventories, and finance are collected from the various subsidiary sites through file transfers each night. The data are mined, and the information is available to users who are permitted to log-into the DW. Study findings have revealed that a successfully implemented ES improves an organization's operational efficiencies and creates competitive advantages by enabling agile practices. The integration of the entire value chain, optimization of processes, knowledge management, and information sharing are some of the attributes that create capability for an effective response in the competitive market. The deployment of supply-chain-wide strategies to promote concurrent engineering, project and team management with creation of a virtual enterprise through value chain integration leads to a highly agile environment including rapid engineering, knowledge management and manufacturing capabilities. Built-in controls through ES tools such as BI lead to knowledge-leveraging actions that assist managers in implementing strategies and monitoring performance. The deployment of agile strategies in the three case studies is shown in Table 2. Additionally from the study findings, it is evident that ESs support cuts across all of the building blocks in Bustelo et al. 's model (Figure 1). This is illustrated through a revised agile manufacturing production model (Figure 2) that highlights the support of ESs in each of the building blocks. The study findings are further categorized into manufacturing strengths related to costs, flexibility, quality, delivery, and service based on the Bustelo et al. 's model (Figure 1) and presented as outcomes to improve a firm's agility from ES implementations. Findings have highlighted several cost benefits with use of ESs such as reduction in global inventories throughout the supply chain. This was achieved through the new ES supported S&OP process enabling regular supply and demand reviews with key suppliers, customers, and regional offices. Increase in process efficiencies was achieved with system automation and optimization leading to cost savings in operations, resources, and capacities. Productivity was improved with accurate production planning and scheduling using add-on tools such as APS and production optimizer. Initiatives such as JIT material supplies achieved cost benefits with enhanced agility. This finding is consistent with an earlier study (Inman, Sale, Green Jr., & Whitten, 2011) that also confirmed JIT programs enhance a firm's agility in supply chain. Additionally, quality related real-time alarms triggered a proactive response for actions leading to reduction in quality costs. Finally, improved analytical processes and decision making achieved cost reductions in overall operations throughout the value chain. Changes to demand became timely evident in the new ES enabled S&OP processes, initiating an immediate response to adjust manufacturing plans. The APS functionality accurately schedules production as well as grants flexibility in incorporating amendments to demand. The MRP triggers alterations to production and procurement plans based on demand changes, resources availability, or any other constraints prompting instant actions. Speed and flexibility have been emphasized as essential means for responding to specific customer needs. Additionally, integration with external partners to cooperate and leverage competencies for mutual benefits has also been considered as a vital tool for competitive advantage (Yusuf et al., 2004). In this study, speed and flexibility in responding to customer demand was achieved through ESs. These systems assisted in integrating quickly with distributed partners to augment each other's capacities and enhance flexibility in supply of products in growing markets. Findings revealed support in quality assurance with use of ESs such as ad-hoc reports on vendor and in-house production quality. The system ensured that the products were built to specifications and removed errors in the build process. Further, with add-on modules such as FS Plus, PLM, and APS, additional work procedures could be defined consistently across the value chain. Organization-specific processes embedded into the ESs could identify opportunities/issues, enable setting of schedules, and monitor performance. However, firms need to align these processes into daily routines to be more responsive to market forces. The ES transactions enabled with built-in checks avoided data entry errors and triggered rule-based alerts such as transactions leading to negative stock. Each transaction created a record to track stock movement. In case of a quality issue, the transaction could be traced back to identify the related production job for a root cause analysis and improved development of future products. The engineering functionality facilitated concurrent engineering and strategic sourcing of parts leading to a better product. Yusuf et al. (2004) have noted quality as being a vital requirement in enhancing agile supply chain capabilities, which aligns with the findings of this study. Much improvement has been reported in overall product deliveries to customers through use of ESs. Automated schedules for all manufacturing jobs not only optimized capacities, but also prioritized production based on customer due dates leading to improved delivery performance. Material availability reports highlighted stock-on-hand, material short for scheduled production, lead times, and open purchase orders with due dates for required build items. System alerts got triggered for line shortages, which helped to action vendor supplies and inventories. ES tools such as the production optimizer achieved constraints-based dynamic machine loading streamlining product flow in the factory. Timely deliveries has been emphasized in the past as an outcome of manufacturing agility leading to operational and firm performance (Inman et al., 2011). In this study, all three firms improved on-time deliveries to customers with faster communication, and improved response through use of their ESs. Study findings highlighted that the customer orders could be entered by regional sales staff 24x7 via remote access with availability of key information such as product stocks and costs, enabling delivery commitments and order confirmations to customers. Tools to manage customer accounts, and contracts with information support such as status of deliveries with full traceability improved customer responsiveness. Furthermore, ES tools were specifically helpful in performing customer service where engineers go out to repair products failed in the field and carry out preventive maintenance to installations at customer sites. These tools also helped in scheduling repairs on returned products where the ownership remained with customers. A record of the kind of repairs was maintained helping find the root cause with related costs. The system also tracked warranty expenses so that the company could improve the cost of their products and reduce warranty costs. Zhang (2011) suggested existence of three basic types of manufacturing strategies: quick, responsive, and proactive to promote agile capability. The service benefits from ESs are consistent with all of the three capabilities to enhance agility in manufacturing firms. Findings revealed that the extended capabilities of ES tools include use of analytic methods for knowledge creation. Knowledge-based processes such as BI, KPI reporting, benchmarking, balanced scorecards, dashboards, and data warehousing assist in improving a firm's performance through effective operational procedures. Enhanced performance monitoring and information availability leads to improving organizational agility and achieving overall results. In past studies, use of decision-making models in agile supply chains based on information availability have been considered vital in reducing uncertainties and improving agility (e.g.,Wu & Barnes, 2011). In this study, the knowledge-enabling processes used through ESs, which assist in establishing analytical decisions and enhancing agility are presented in Table 3. This study has demonstrated the creation of organizational capability in manufacturing firms with use of ESs to proactively compete in the marketplace responding speedily and effectively to changes in the business environment. The study has explained the use of ESs in manufacturing operations and how it enhances organizational agility throughout the supply chain. This study also provides insights into the various knowledge-leveraging processes organizations adopt using ESs for data transformation and analytical decision making for realizing goals and business strategies. The study has highlighted how companies can become agile and deliver flexible solutions deploying appropriate strategies such as value chain integration, concurrent engineering, agile technologies, and knowledge management through use of ESs, which aligns with Bustelo et al. 's model (Figure 1). The study confirms that business performance outcomes follow when manufacturing strengths in cost, flexibility, quality, delivery, and service are realized in the competitive environment. This can be achieved through use of ESs with tools for data extraction and their analyses. Critical areas that require attention are identified and business managers continually monitor key drivers via ES reports and benchmarks in pursuit of business goals. Also, human resources possess the necessary skills in ES usability. Future research can replicate this study using diverse selection criteria for organizations - small firms or different industry sector and compare findings with this study. Banker, R. D., Bardhan, I., & Asdemir, O. (2006). Understanding the Impact of Collaboration Software on Product Design and Development. Information Systems Research, December 2006, 17(4), pp. 352-373. Baskerville, R., & Dulipovici, A. (2006). The Theoretical Foundations of Knowledge Management. Knowledge Management Research and Practice, 4, pp. 83-105. Bergeron, B. P. (2003). Essentials of Knowledge Management. New Jersey: John Wiley & Sons, Inc.
Berkman, E. (2005). When Bad Things Happen To Good Ideas. CIO NZ, May 2005, pp. 24-31. Bustelo, D., Avella, L., & Fernandez, E. (2007). Agility Drivers, Enablers, and Outcomes: Empirical Test of an Integrated Agile Manufacturing Model. International Journal of Operations & Production Management, 27(12), pp. 1303-1332. Chen, C. C., Law, C. C. H., & Yang, S. C. (2009). Managing ERP Implementation Failure: A Project Management Perspective. IEEE Transactions on Engineering Management, February 2009, 56(1), pp. 157-170. Choo, C. W. (2006). The Knowing Organization: How Organizations Use Information to Construct Meaning, Create Knowledge, and Make Decisions. New York: Oxford University Press. Choudri, A. (2002). The Agile Enterprise Manufacturing Handbook of Best Practices: An Innovation, Productiity, and Quality Focus (pp. 1-26). Florida: CRC Press. Christopher, M. (2000). The Agile Supply Chain: Competing in Volatile Markets. Industrial Marketing Management, 29(1), pp. 37-44. Davenport, T. H. (1998). Putting the Enterprise into the Enterprise System. Harvard Business Review, July/August 1998, 76(4), pp. 121-131. Davenport, T. H., Harris, J. G., & Cantrell, S. (2002). The Return of Enterprise Systems: The Director's Cut: Cambridge, MA: Accenture Institute for Strategic Change. Denzin, N. K., & Lincoln, Y. S. (2003). Strategies of Qualitative Enquiry. Thousand Oaks, California Sage Publications Inc.
Goodhue, D. L., Chen, D., Q., Boudreau, M.-C., Davis, A., & Cochran, J., D. (2009). Addressing Business Agility Challenges with Enterprise Systems. MIS Quartely Executive, 8(2), pp. 73-88. Gunasekaran, A., & Yusuf, Y. (2002). Agile Manufacturing: A Taxonomy of Strategic and Technological Imperatives. International Journal of Production Research, 40(6), pp. 1357-1385. Hasan, M. A., Sarkis, J., & Shankar, R. (2012). Agility and Production Flow Layouts: An Analytical Decision Analysis. Computers & Industrial Engineering, 62, pp. 898-907. Inman, R. A., Sale, S. R., Green Jr., K. W., & Whitten, D. (2011). Agile Manufacturing: Relationship to JIT, Operational Performance, and Firm Performance. Journal of Operations Management, 29, pp. 343-355. Keyes, J. (2006). Knowledge Management, Business Management, and Content Management: The IT Practitioner's Guide. New York: Auerbach Publications. Lei, D., Lian, L., & Xiao, S. (2011). The System Construction and Research Review of Agile Manufacturing. Paper presented at the In Management and Service Science (MASS), 2011 International Conference IEEE, pp. 1-4. Maditinos, D., Chatzoudes, D., & Tsairidis, C. (2012). Factors Affecting ERP System Implementation Effectiveness. Journal of Enterprise Information Management, 25(1), pp. 60-78. Nicolaou, A. I. (2004). Alignment of AIS with Business Intelligence Requirements. In M. Anandarajan, A. Anandarajan & C. A. Srinivasan (Eds. ), Business Intelligence Techniques. New York: Springer, pp. 167-179. Power, D. J. (2007). A Brief History of Decision Support Systems, version 4.0, accessed August 9, 2009, DSSResources.COM. http://dssresources.com/history/dsshistory.html. Ragowsky, A., & Gefen, D. (2008). What Makes the Competitive Contribution of ERP Strategic. ACM Digital Library, April 2008, SIGMIS Database, 39(2), pp. 33-49. Sherehiy, B., Karwowski, W., & Layer, J. (2007). 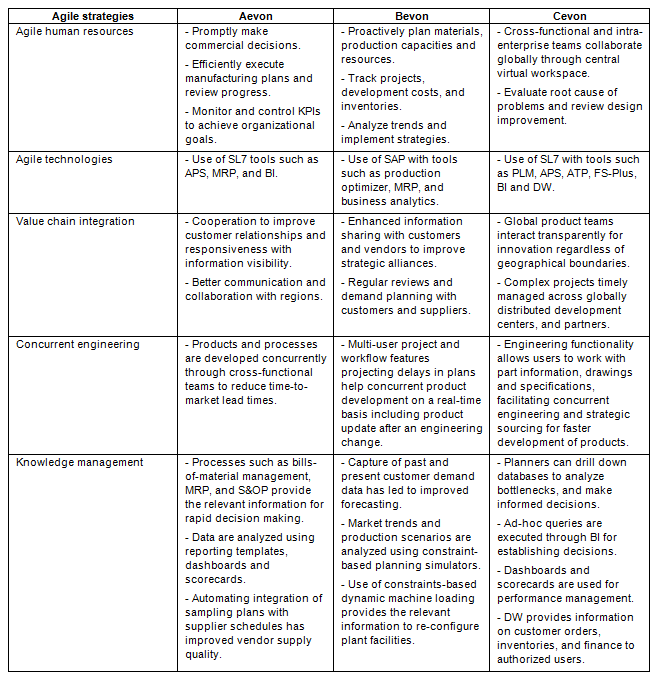 A Review of Enterprise Agility: Concepts, Frameworks, and Attributes. International Journal of Industrial Ergonomics, 37, pp. 445-460. Subramoniam, S., Tounsi, M., Ghani, S. K., & Krishnakutty, K. V. (2009). ERP and Beyond. In J. N. D. Gupta, S. K. Sharma & M. A. Rashid (Eds. ), Handbook of Research on Enterprise Systems. New York: IGI Global, pp. 329-345. Wu, C., & Barnes, D. (2011). A Literature Review of Decision-making Models and Approaches for Partner Selection in Agile Supply Chains. Journal of Purchasing and Supply Management, 17, pp. 256-274. Yusuf, Y., Gunasekaran, A., Adeleye, E., & Sivayoganathan, K. (2004). Agility Supply Chain Capabilities: Determinants of Competitive Objectives. European Journal of Operational Research, 159, pp. 379-392. Zhang, D. Z. (2011). Towards Theory Building in Agile Manufacturing Strategies--Case Studies of an Agility Taxonomy. International Journal of Production Economics, 131, pp. 303-312. Zhang, M., & Zhang, J. (2009). Study on Application of E-business Based ERP in Coal Enterprise. Paper presented at the International Conference on Information Management and Industrial Engineering, IEEE Computer Society, pp. 88-91. Copyright © 2014 Mathrani, S.